“Mashallah” Title page from the ‘De scientia motus orbis by Albrecht Dürer. (1504). 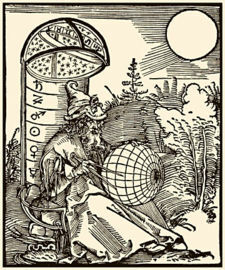 Most traditional astrologers are aware of the scheme of planetary days and accept them without another thought. At first glance there seems to be no real pattern to the allocation of certain planets to certain days. Like everything else handed down to us in traditional astrology, it’s worth spending a little bit of time investigating rather than simply accepting everything handed down to us from the tradition without question. If we don’t we will never understand the rationale behind it or how everything is linked. When looking at the planetary days a pattern soon emerges, enabling us to see how they correlate with the planets. It is apparent that Sect has played its part in the process. Although there are two great lights in the sky, it is the sun that dictates sect. The sun rules over the day with its life giving rays. The moon on the other hand rules the night. It comes second to the sun for it has no intrinsic light of its own and reflects the sun’s light. It is dependant on the sun’s rays. By honouring this fact and if we start the week with Sunday, we see that there are three days ruled by masculine planets and two days ruled by feminine planets. This gives us masculine and feminine days. There is one day of the week that is mixed. Day 1. Sunday is ruled by the sun lying exactly at the centre of heaven. Day 2. Monday is ruled by the moon lying exactly between earth and heaven. Day 3. Tuesday is ruled by mars, the first planet above the sun. Day 4. Wednesday is ruled by mercury, the first planet above moon. Day 5. Thursday is ruled by jupiter, the second planet above the sun. Day 6. Friday is ruled by venus, the second planet above moon. Day 7. Saturday is ruled by saturn, the third planet above the sun. The odd-numbered days belong to the sun and the diurnal sect planets. The even-number days belong to the moon and the nocturnal sect planets. The exception to this rule is mercury, partaking of both natures, it rules the mid-week day of Wednesday.